Despite the fact that the World Wildlife Fund (WWF) apparently provided a significant portion of the funding for the recently concluded International Forum on Conservation of Polar Bears (December 3-6, Moscow), it appears in the end they and their NGO cohorts were prevented from having an undue amount of influence at the meeting. For that we can thank the delegates of the five Arctic nations: three cheers for common sense! This news did not emerge until late yesterday (Friday, Dec. 6), after the meeting had concluded: no mention was made of NGOs being excluded in the press releases and stories written before then. For example, see IUCN story, Dec. 5; WWF story, Dec. 4; Times of India report, Dec. 5 and this Arctic Journal story Dec. 6. There was nothing in any of them about NGOs and journalists being barred from parts of the meeting they thought they would be allowed to attend. Note that biologist Mitch Taylor, booted-out of the Polar Bear Specialist Group because he did not agree with the group’s position on global warming, attended as part of the Canadian contingent (see list at the end of this post), which was a bit of a surprise. However, the exclusion from the meeting of WWF and their buddies is the big news as far as I’m concerned. [The media seems more interested in the fallout from a twitter message sent on the final day of the meeting by Canada’s Environment Minister Leona Aglukkaq — more on that in my next post]. “A crucial meeting of the five polar bear range states closed today in Moscow but not before government delegates ousted journalists and representatives of nonprofit groups who had been invited to provide input to the meeting. About 20 people were barred. The NGO reps and reporters were only allowed to attend for two hours on Thursday, the first day of the two-day meeting. Well, well. It would have been nice to have a truly unbiased observer sitting in on those discussions. But professional activists with well-known agendas would have added nothing but disruption and drama-queen moments — the things at which they excel. According to the distributed agenda, there was a good portion of the meeting that was meant to be attended only by the official government-appointed working groups [“range state delegations”] and the IUCN Polar Bear Specialist Group (PBSG) representatives Dag Vongraven and Steven Amstrup, who is (as I’ve pointed out before) also spokesperson for the NGO, Polar Bears International (PBI). But here’s an oddity. Have a look at the screencap (below) of the photo taken by WWF rep. Geoff York. It was taken by York during a portion of the meeting that was restricted to official delegates (i.e. the “ousting” incident did not affect it). This photo was posted on the PBI website later that day (Dec. 5), as part of a dedicated PBI news story celebrating the fact that their guy “Steve” made a presentation at the Moscow forum. Here’s my question: did the officials let York in just to take a photo or was he attending the whole thing, based on his newly-issued PBSG credentials? 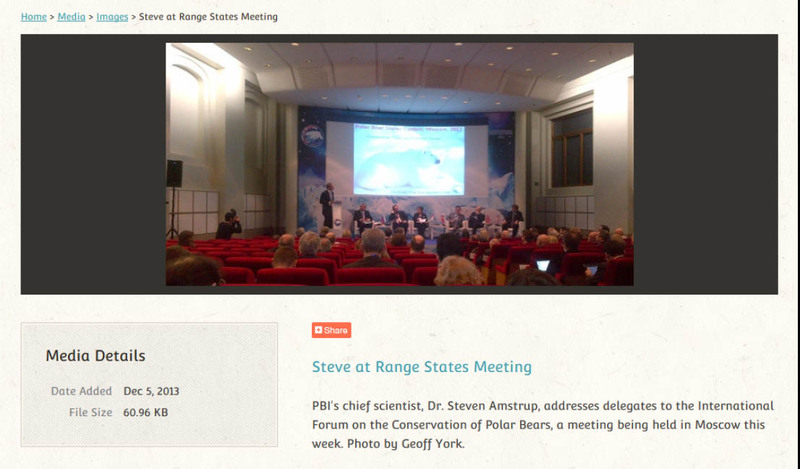 Screencap of the photo details posted on the Polar Bears International website Dec. 5 2013. The photo was taken by WWF representative Geoff York, who should not been attending this portion of the meeting. Did officials let him pop in to take the photo or was he allowed to participate in the entire day’s proceedings, using his new Polar Bear Specialist Group credentials? “Teresa Telecky, PhD, director of wildlife at the nonprofit Humane Society International, was one of those ousted from the meeting. “This action has removed meaningful dialog between the governments and civil society on the issue of polar bear conservation,” she told ENS. It appears that Telecky really thought she was going to get to have a “dialogue” with government officials. Was she promised this or not? We might never know. The fact that she went in believing she and her comrades would be permitted to ask questions and demand answers, suggests the real reason why their invitation to attend was revoked after the opening ceremonies. Seems to me there was quite enough biased viewpoints being presented by the PBSG polar bear biologists in attendance without adding the voices of professional animal rights activists. WHAT DID GET DONE AT THE MOSCOW FORUM? “At the meeting, the Parties to the Polar Bear Agreement agreed to a declaration recognizing the importance of addressing climate change and underscoring that additional stressors, like overharvest, must be reduced. Parties also agreed to address poaching and illegal trade and to improve reporting and monitoring of legal trade. I think that about sums it up. Here is the declaration the government delegates signed: nothing specific, nothing legally binding, plans to continue the discussion at the next regularly scheduled “range state” meeting in 2015. Canada – a contingent of 21, headed by Environment Minister Leona Aglukkaq, including ousted-from-the-PBSG-for-his-global-warming-agnosticism biologist Mitch Taylor (Lakehead University), polar bear technical committee and wildlife manager Marsha Branigan (Northwest Territories), PBSG biologist Nick Lunn (Environment Canada), and a Mountie (RCMP officer Carl Joseph Carre [so Canadian!]). Noteworthy by their absence: polar bear alarmists Ian Stirling, Andrew Derocher, Gregory Thiemann. Greenland – a contingent of 5, including recently added PBSG delegate Kristin Laidre. Norway – a contingent of 8, including PBSG delegate Jon Aars. USA – a contingent of 12, headed by US Fish & Wildlife Service Regional Director Geoff Haskett, and including recently added PBSG delegate Eric Regehr. Russia – a contingent of 47 (! ), including PBSG biologists Andrey Boltunov and Stanislav Belikov. But not Nikita Ovsyanikov. IUCN Polar Bear Specialist Group – a contingent of 2 (Chairman Dag Vongraven of Norway and Polar Bears International spokesperson Steven Amstrup). “International environmental organizations” included World Wildlife Fund (WWF, 10 delegates); International Fund for Animal Welfare (IFAW, 4); Natural Resources Defense Fund (NRDF, 2); Center for Biological Diversity (CBD, 1); Humane Society International (HSI, 1); TRAFFIC International (1). Note that recently added PBSG delegate Geoff York was in attendance as a WWF representative. Assorted scientific advisors, inter-governmental organizations (including CITES and IUCN), and “conservation partners” (funding organizations), for a total group size of 143 (full list here; contact me for a pdf if it disappears). This entry was posted in Advocacy, Conservation Status and tagged Amstrup, Circumpolar Action Plan for Polar Bear Conservation, conservation, Environment Canada, environmental organizations, Humane Society International, Leona Aglukkaq, Mitch Taylor, NGOs, polar bear, Polar Bear Specialist Group, Polar Bears International, twitter storm, Vongraven, World Wildlife Fund, WWF. Bookmark the permalink.